Connect. Create. Share. A turnkey display that brings out the best in people. Use the tool palette to write text and draw freehand on your document. Save it to memory or email it direct from the display. Included stylus pens and eraser let you write large amounts of text just like a regular whiteboard. Don't lose the crowd—or your cool—in endless menus while you search for content or functions. With the BF1 Series, everything is to hand in a discreet menu bar at the bottom of the screen that offers instant access to source inputs, whiteboard tools, and other controls you use most frequently. Even when the pressure's on, you'll look like a pro. Frequently used functions such as input selection, pen tool, enlargement tool, and volume control can be found in the menu bar. Access detailed information or hide it for uninterrupted full-screen display. Up to four of your most frequently used inputs can be named and assigned to the menu bar for quick and easy switching. Smooth operation without a remote controller allows you to focus on making a creative presentation. Playing Full HD video, still images, and digital documents from USB storage devices couldn't be easier. Just insert a thumb drive into the USB port and start presenting without needing to connect a PC. The Memory Viewer app enables image* (JPEG, BMP) and video* (WMV, AVI, MOV, MP4, MPG) selection from handy thumbnail previews. Produce up to 100 pages*1 of work on the whiteboard and save them to the built-in memory*2 or USB thumb drive as JPEG image files. You can also copy data stored on internal memory to a USB drive, or send your pages as image files directly from the screen via email*3. Keeping everyone in the loop is simple. *1 With built-in memory setting to ON. When individual file data size is large, the number of pages that can be saved may decrease. *2 Built-in memory ON/OFF is included. When OFF is selected, only one whiteboard page can be created. *3 Can be sent as JPEG format only. Download free via App Store (iOS) or Google Play (Android™). Apps for PC, iOS, Android™, and Easy Wireless Stick feature Multi-Live Mode. This function enables media display from up to 16 different devices in split-screen configuration (4 or 16 window). 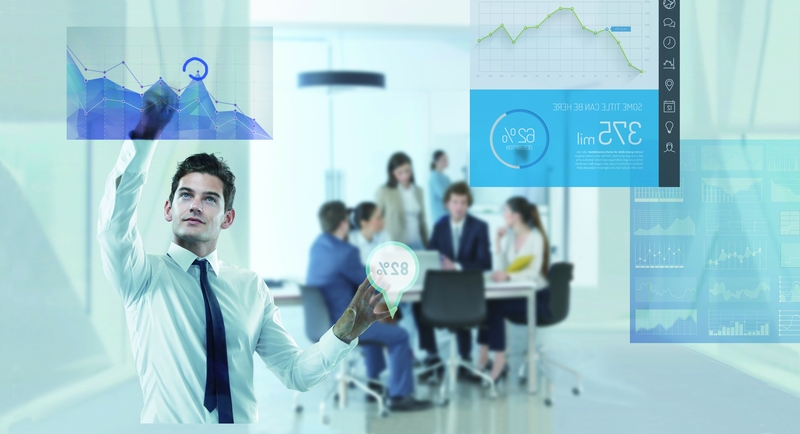 You can also transmit content from one PC to up to eight projectors or displays. * When using the [Simple], [S- DIRECT], and [M-DIRECT] setting for your display, you can connect up to 10 PCs at the same time in Multi-Live mode. DIGITAL LINK transmits uncompressed Full HD video, audio, and control commands through a single CAT 5e or higher STP cable for up to 100 m (328 ft). Connect all your source devices to an optional DIGITAL LINK Switcher (ET-YFB200G)/Digital Interface Box (ET-YFB100G) and use just one cable to link your display. This simplifies installation and saves on cabling costs. Note: Long Reach Mode on ET-YFB200G is not supported. Use a VGA cable to mirror content* on a second display or projector—even the notes you might add to documents, images, or video during your presentation. 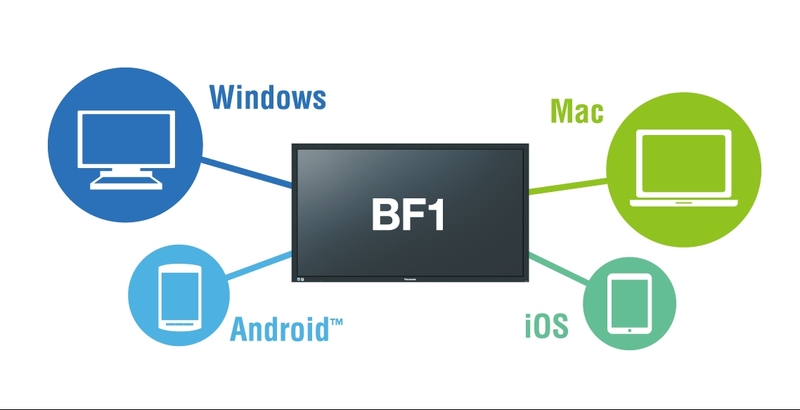 This dual-display capability makes the BF1 series ideal for use in larger venues. Supported inputs include HDMI, DVI, PC, Memory Viewer, and Whiteboard. Protective glass adds extra security against impact. This insurance is invaluable in high-traffic areas such as conference rooms, classrooms, and public spaces. An improved Anti-Glare (AG) screen treatment scatters reflected light from overhead illumination to reduce glare and improve all-round visibility.